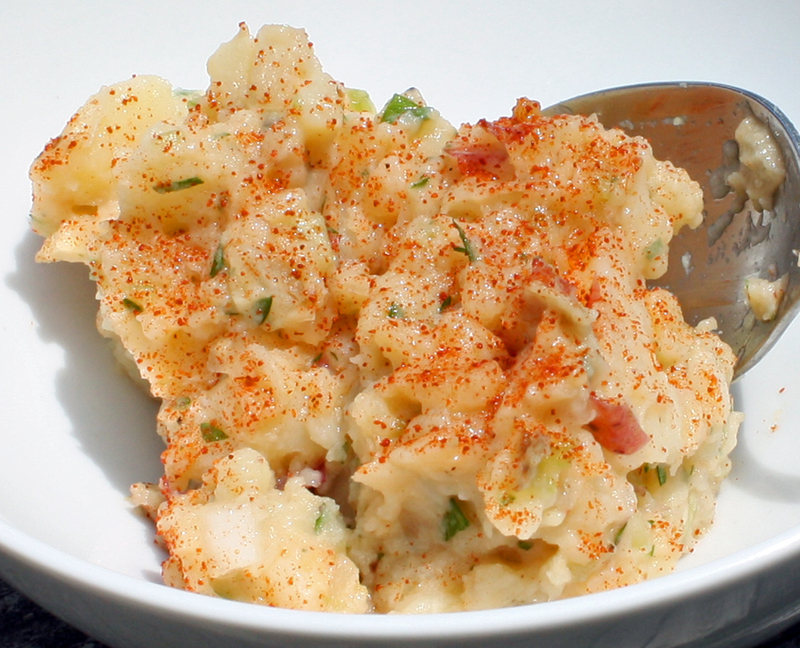 A better way to recolonize the colon after taking antibiotics is to consume foods that enhance growth of good bacteria, such as this fat-free potato salad which is high in resistance starch. The lesson from this recent study is that we’re not only wasting our money taking probiotics after we’ve been on a course of amoxicillin, ciprofloxacin, or other antibiotics, but we’re probably doing harm. Probiotics won’t reestablish microbial populations in the large intestine. In fact, they may hinder natural recolonization. Importantly, in both mice and humans, we demonstrate that enhanced post-antibiotic probiotic colonization comes at a tradeoff of delayed indigenous microbiome and host mucosal transcriptome reconstitution to a homeostatic configuration as compared to either watchful waiting or aFMT. 5 months! So, if we’re taking probiotics to reestablish our microbiome, it may take 5 months or more to restore it – after we stop taking the probiotics! Doing nothing or “watchful waiting” was better. The mechanism: Probiotics are acting as a “place holder,” blocking the recolonization of normal resident bacteria. This may also apply to fermented foods people consume for their bacteria … yogurt, kefir, sauerkraut, pickles, miso, tempeh. Not saying these aren’t beneficial foods in other respects, but their bacteria probably won’t help reestablish our microbiome, and may in fact hinder it. The best thing to do (apart from inserting some of our pre-sick bacterial colonies back into our colon – autologous FMT – which this study did find useful) is to eat starches, all kind of beans, pastas, oatmeal and other cooked cereals, rices, breads, potatoes, yams, squashes, bananas. Any undigested carbohydrates in those will end up feeding what’s left of the good bacteria in our colon. (This is what PREbiotics do.) Even if you didn’t take antibiotics, it’s a good idea to regularly feed these good bacteria. It will ensure a healthy microbiome, which helps stave off future infections as well as lowering the risk of many chronic diseases. This entry was posted in Uncategorized on September 13, 2018 by Bix.